Is Social Media Drowning In A Sea of Fakery? Posted May 14th, 2014 by Andrew Smith & filed under Digital marketing, Featured, Social media. 61.5pc of web traffic is not human. 57pc of online video ads are unviewable. These are just some of the pointers that have emerged in recent times to suggest that a lot of activity in the world of social media and digital advertising is worthless fakery. Worse still, many people are making money (or measuring their apparent success) on the back of numbers that aren’t a true reflection of reality. And this is a big problem. Particularly with regard to measurement, evaluation and ROI – because many people may be making decisions about time, money and resources based on data that bears no relation to the truth. Take Twitter followers for example. Imagine your Tweet is ReTweeted by an account with a high number of followers. You might be tempted to say that this single act has resulted in a certain number of impressions or opportunities to see being created. Set aside issues such as how much Twitter content a real human being can consume in a day on their small mobile device screen (which is where most people consume social content). What if many of those potential impressions were simply false – because the Twitter followers concerned are fakes? I’ve found the Fake Follower tool from statuspeople.com a fantastic sanity check over the last 12 months. It has been really helpful at showing which accounts have large numbers of fake followers. In fact, some people argue that high profile, high follower accounts are more prone to gaining fake followers. Take @bbcbreaking for example. On the surface, it has 9.68 million followers. If your client was featured in a story shared by BBC Breaking News, you might be tempted to add 9.68 million to your reach figure. But run that account through the Fake Follower tool and you find that 44pc are fakes – which equates to roughly 4.25 million accounts. Nearly half of @bbcbreaking’s reach figure isn’t real. Even the apparently “active” Twitter accounts only total around 13pc – or roughly 1.25 million (not a small amount, but a lot less than the headline figure of 9.68 million). Trying to get a sense of true reach is important. Not least in terms of expectation setting. Getting a high profile account like BBC Breaking sharing relevant content might lead you to expect a certain number of people reading and engaging with that content. Let’s return to our fictitious piece of coverage. If @bbcbreaking shared a piece that featured your client, you might anticipate tens of thousands if not hundreds of thousands of people clicking that link to go and read the piece. However, the data doesn’t support this. BBC Twitter accounts all seem to use a branded version of the bit.ly URL shortener. 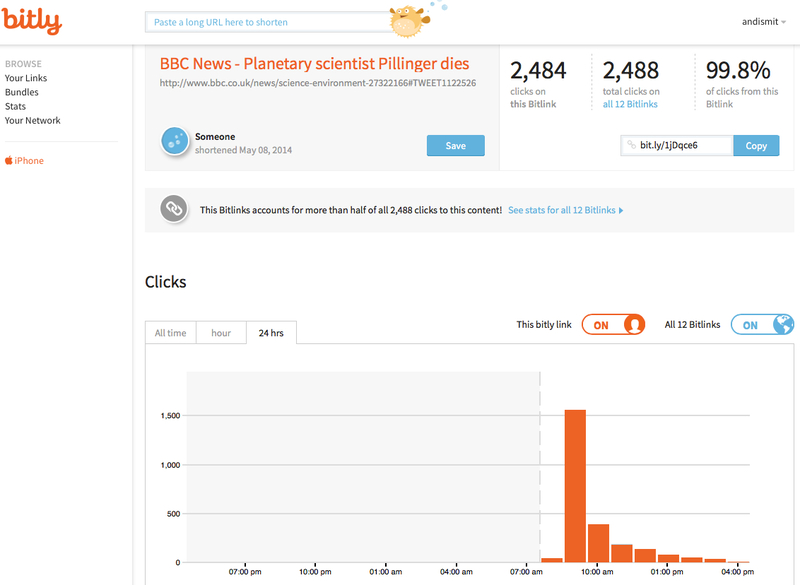 As a result, anyone can see the click through data for shared BBC links (or any bit.ly link for that matter – simply append a ‘+” sign at the end of any bit.ly link and you’ll get taken to the data page for the link). Here’s a Tweet posted today at 8:59 AM. By 4pm, it had received 320 Retweets (apparently the second most shared BBC web site story that day at time of writing). So, in theory, this Tweet would have been potentially viewable by the 9.68 million followers of @bbcbreaking as well as the additional shares from the ReTweets. So how many clicks has the story received 7 hours later? 10,000? 100,000? No, 2,484. (Given the half life of a typical Tweet, it is unlikely this Tweet will see much more in the way of engagement or clicks from now on). Just based on @bbcbreaking’s own follower numbers that means a CTR of 0.02pc. Of course, that figure can be explained if you consider that 44pc of the apparent audience isn’t real – and that even the “real” audience won’t necessarily have even seen the original Tweet. But this mismatch between surface metric and reality is seen elsewhere. Publishers that buy cheap web traffic to boost their visitor numbers to maintain their CPM ad rates to advertisers. Journalists being renumerated on the basis of page views – leading to writing stories to simply generate traffic (any traffic) to again boost visitor numbers for the purpose of maintaining ad rates. Twitter followers, Facebook fans, YouTube views, web traffic, you name it – all of these things can be cheaply faked and sold to those who stand to gain by artificially inflating the metrics that many people rely on to measure success. Raw web traffic remains a key metric used by people to judge success. But even that won’t necessarily lead to engagement or action. ChartBeat CEO Tony Haile wrote recently that there is no correlation between traffic and engagement. Getting a handle on true reach and engagement in social media and digital advertising is crucial. Unless you establish baselines of success on reality, you are inevitably going to end up disappointed and/or wasting valuable time, money and effort on the wrong things. In short – don’t rely solely upon easy to access metrics to measure success. And certainly demand to know exactly how a metric is calculated. Sooner or later, reality has a nasty habit of rearing its head.